Tournament basketball games tend to be frenetic and nervy affairs. The screams and moans from the fans are more exuberant and panicked, each referee’s call more painstaking, each rebound more fiercely contested, each possession more priceless. The environment tests a team’s personality as much as its skill. Being tough and composed instead of skittish is sometimes as important as sheer ability. In winning Saturday’s Div. 1 North final, the Everett Crimson Tide far exceeded the requisite combination of talent and grit needed to overwhelm Lawrence, 68-56, at the Tsongas Center in Lowell. Their fourth-quarter performance was flawless and scintillating, a case study in how to capture a championship just at that moment when you think the outcome is a 50-50 proposition. The Everett High School basketball team celebrwates its victory over Lawrence in Saturday’s Div. 1 North Final at the Tsongas Center. The sectional crown is the Crimson Tide’s first since 1994. Isaiah Likely, whose all-around excellence has been key to Everett’s postseason success, skies through the lane during the Crimson Tide’s 68-56 victory in Saturday’s Div. 1 North Final. Ghared Boyce hoists the Div. 1 North Sectional trophy following the Crimson Tide’s 68-56 victory over Lawrence. The win gave Everett its first sectional crown since 1994. EHS senior Caleb Jacobs (11) keeps his eyes focused up-court as he begins a Crimson Tide fast break. The Crimson Tide bench celebrates in the closing seconds of their victory over Lawrence in the Div. 1 North Final. Crimson Tide cheerleaders are pictured during Saturday’s Div. 1 North final at the Lowell’s Tsongas Center. Nate Mehu, who made valuable contributions off the Everett bench in the win over Lawrence, looks for an open teammate. Jalen Smith chipped in with six points during Saturday’s victory over Lawrence. EHS led by a mere two points, 43-41, after three quarters. Four minutes later, the first smattering of Lawrence fans was heading into the brisk March air, knowing the Lancers’ season had come to an abrupt conclusion. The Crimson Tide scored the first 11 points of the final frame, six by senior Ghared Boyce, who had a game-high 28 points, 21 in the second half. EHS extended the dramatic run to 17-2 and swelled its lead to 62-43 with 2:16 remaining. The cushion ballooned to 20 points (68-48) before Lawrence scored eight late points to trim the final margin to a deceiving 12 points. Everett did it all during the electric spurt, from playing hounding defense, to pulling down defensive rebounds and getting out in transition, to forcing turnovers, to continually making the extra pass to create lay-ups. Boyce and expert dribbler/distributor/driver Isaiah Likely were fantastic, as one might expect, while Erick Thompson (six points), Nate Mehu (very active on the glass), and Caleb Jacobs and Monte Campbell (both tireless in pushing the tempo) all played vital parts in running Lawrence (21-3) out of the arena. “A great team victory,” head coach John DiBiaso simply and accurately described it afterwards. Certainly, the win is one of the very biggest in the history of the EHS boys basketball program. The Tide improved their gaudy record to 23-1 and, far more importantly, gave DiBiaso and the school their first sectional crown since 1994. And it sent the Tide to Monday’s state semifinal vs. Mansfield inside TD Garden. Add to this the fact that this postseason saw DiBiaso win his 500th game and Boyce become the first player in the history of the boys program to surpass 2,000 points, and it’s easy to label this the greatest hoop campaign since EHS’s Eastern Mass. title-winning season of 1990-91. 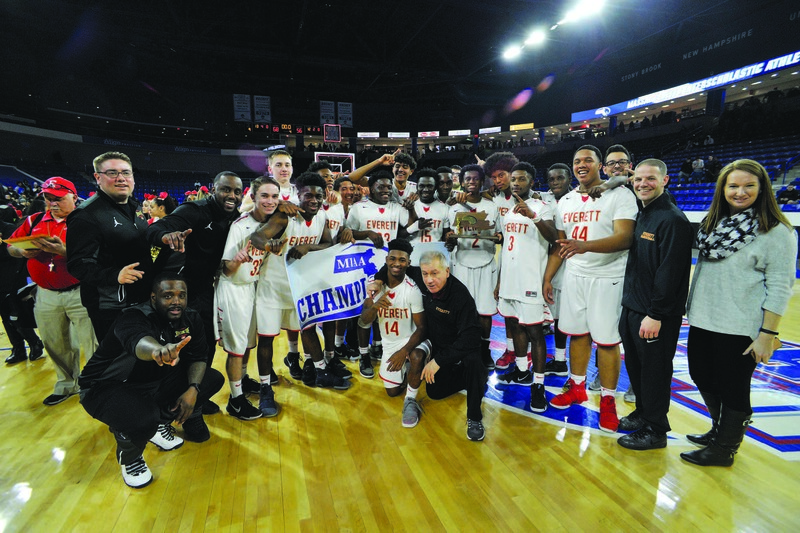 In the Lancers, Everett was facing a team that scored 75, 80, and 68 points in its three previous tournament wins over Andover, St. John’s Prep, and Cambridge. But aside from a 21-point outburst in the second quarter, when they turned a 16-9 deficit into a 30-29 halftime lead, the Lancer offense sputtered. They started the game 4-of-17, and none of their starters got hot enough for the team to lean on. Juan Felix Rodriguez (11 points) and Luis Reynoso (6), who combined for 41 points in Lawrence’s semifinal win over Cambridge, had just 17 vs. the Tide’s disciplined defense. Despite all of that, the game was very much up in the air for three quarters. Everett led 9-0, 13-3, and 16-9 at the end of one quarter. The spread should have been bigger; Everett made only 7 of its 17 field goal attempts in the quarter, including a few easy chances around the rim. Lawrence loosened up in the second, outscoring Everett, 21-13, as four different Lancers hit 3-pointers, including two by Cristian Kinsley. The spurt sent Lawrence’s sizable fan base into a frenzy, although the Lancers couldn’t recapture that energy level at any point in the second half. The teams traded leads four times early in the third quarter before a driving lay-up by Boyce gave the Tide the lead for good, at 37-36. Everett pushed the advantage to five, 43-38, when Boyce scored off a Lawrence turnover. Kinsley answered with his last 3-pointer of the night, setting the stage for Everett’s monumental fourth-quarter display.